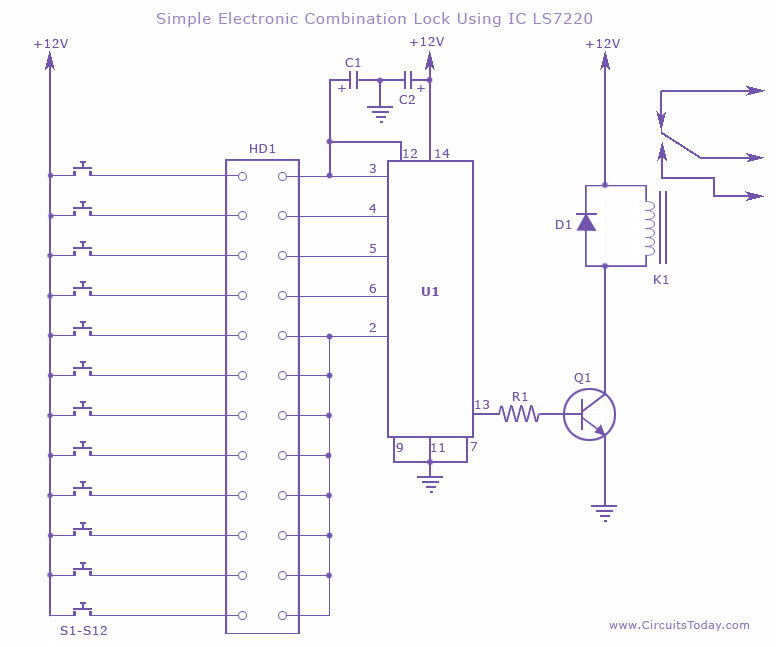 A simple electronic combination lock is designed using IC LS 7220. This circuit can be used to activate a relay for controlling (ON & OFF) any device when a preset combination of 4 digits are pressed. The circuit can be operated from 5V to 12V. 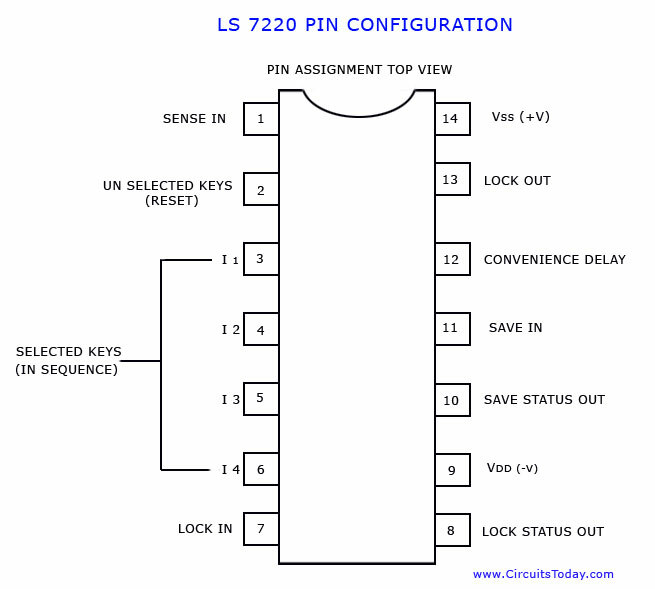 The LS7220 IC is a MOS digital lock IC which can recognize upto 5040 different combinations of 4 digit combinations. The 4 digital password combination has to be hard-wire programmed. To set the combination connect the appropriate switches to pin 3,4,5 and 6 of the IC through the header. As an example if S1 is connected to pin 3, S2 to pin 4 , S3 to pin 5, S4 to pin 6 of the IC, the combination will be 1234. This way we can create any 4 digit combinations. Then connect the rest of the switches to pin 2 of IC. This will cause the IC to reset if any invalid key is pressed, and entire key code has to be re entered. When the correct key combination is pressed the output (relay) will be activated for a preset time determined by the capacitor C1. Here it is set to be 6S. Increase C1 to increase on time. For the keypad, arrange switches in a 3X4 matrix on a PCB. Write the digits on the keys using a marker. Instead of using numbers I wrote some symbols! The bad guys will be more confused by this. This electronic combination lock circuit can be further designed with the LS7220 IC to make an Automotive Ignition Anti-Theft Digital Lock.Â For this additional features that are integrated in the IC must be used. Some of the features include the Sense Input feature which enables the IC operation, the save memory feature, the static or momentary lock output, and the convenience delay feature (controlled by an external capacitor). The IC output condition is provided to activate and de-activate a relay. The relay can be used to turn ON and OFF both AC and DC devices. The relay driving power can be fully utilized to control an alarm, a small display, a lamp or even an electromagnet. A door can be symbolized as OPEN or CLOSE using a DC motor that turns the door according to condition. Electronic Lock Circuit Diagram . Low cost fire alarm circuit. can i just connect an LED at pin 13 to show that the code entered is right ?? will that work ??? I had gone thru ur website and quiet interesting, U r proving the theory part of the electronics content where in we are into giving virtual lab. I am sure the synergy between will help the students/hobby users to learn your theory content and practice as well. Please let me know your good time to talk. simply i want to say that the hd1 (header 1 ) is a connector port for the combination lock. that<s my point of view . whats your???????????? what is functionality of position header in â€œElectronic Combination Lock using IC LS 7220â€. Pls give me reply on my E-mail. hi can u tell me the alternate of ls 7220 or can u tell me the place where i can buy it in karachi pakistan. what is the price of LS 7220…???? I too would like a PCB Layout of this project. I have been trying to make one myself but with very little success. Please help. I WANT ASSEMBLE THE 6 CHANNEL OUTPUT HOMETHEATRE AMPLIFIER USING 4x35WATTS TDA7383 QUAD IC. KINDLY GIVE THE DETAILS. THANKING YOU. Hi Sundeep as per proelectron standards first digit stands for material. B stands for silicon and if it is A it is germanium. The second digit indicates the application C stands low power small signal low frequency transistor. 107 stands for the type number (may be voltage current etc)for details refer manufacturers catalog. the suffic A, B, C stands for small signal current gain of the transistor. A 100 t0 250, B 200 to 450, C 400 to 900. The following do not fall on any standards. SL 100 & CL100 S stands for the manufacturer Semiconductor India Ltd., C stands for Continental devices India Ltd. L100 stand for medium power NPN transistor. if it is K100 stands for medium power PNP transistor. BEL100N and BEL100P are also similar trasistors. Ilove the circuit. What I need to know is the Header (HD1). What is it? Is it part of the keypad or do I need to buy it? Could you please explain what is header (HD1)? please! i have project based on sequence timers. could u display a circuit about sequence timers using 555 0r 8051 micro controllers? i have project based on solenoid. could u display a circuit about solenoid?? Hello, please I want to know how smart card digital lock system can be realized with possible circuit diagram. really a valuable circuit, but what is a 12 position header. sorry to ask i am new to electronics. I am student of 4th year.let me know that i should make project on digital lock code or not?? ?kindly send me the pcb layout for digital lock code. Currently I dont have a PCB lay out of this circuit.I tested this circuit on the bread board only. You can easily make the PCB by yourself using software like PCB123.Just have a try. If you cant make one properly, mail me. I will make one for you. Just wanted to let everyone know that LS7220 ICs can be purchased over ebay. would you please post the circuite (and information ) about motor control( with pc)? The ckt. used for making an electronic combinational lock is very easy to understand. I must congratulate the concerned people for making site user friendly..
Hi Hello webmaster ! thanks i had been looking for this for a long time.nice work.would you please post the circuit diagram of a fridge door alarm.thanks in advance.